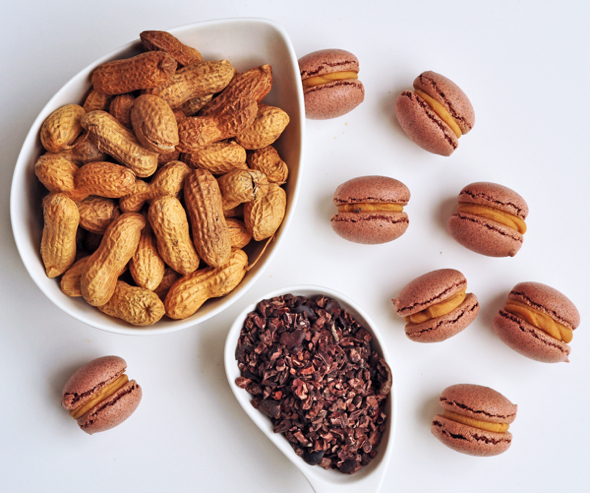 Cocoa Nib Macarons with Peanut Butter Ganache by eat.live.travel.write. I know you've been waiting with much anticipation to see who will be the next guest in the tree nut free macaron series. Most importantly what creative substitute to almond flour and flavor combination they will come up with. I introduce to you the very talented Mardi of eat.live.travel.write. I always had reverence for the calm, collected, self assured confidence she exudes. Maybe it's just the way Australians who circled the globe and settled in Canada are. I absolutely love her photography, recipes and site, but what really sparked me is her Les Petit Chefs series, which sets her apart. I was in awe at the invaluable, inspired work she does fostering an outside the box, creative learning environment for kids. Please make sure to check the Les Petit Chefs series. Last time I tried to make macarons with a different nut flour (peanut), I couldn’t quite get them to work with 100% peanut flour and ended up using some almonds in the mix too. Not great for someone with a tree-nut allergy! So I pulled out my giant bag of cocoa nibs and got to work with them. Warning: experimenting with cocoa nibs can be costly. They are not cheap. I bought a huge bag because I misread the price and didn’t realize until it was too late… I’ve used them in everything from cookies to granola lately but I still had a ton left. Perfect. I followed Stella’s recipe and replaced the almonds gram for gram with finely ground cocoa nibs. Trays and trays of these later, I realize that the secret is in the grinding of the nibs – not so fine that it forms a paste but not so coarse that it thickens the batter so much that it will never thin out enough to the right consistency. About ½ way through this experiment, I messaged Stella bemoaning the cocoa nibs and their finicky nature and she revealed that she, she who BAKES for a living, has not yet mastered the perfect technique. Ok then. So here’s me, a novice mac maker trying to do something that a Culinary Institute of America graduate hasn’t figured out. That made me feel much better. Kind of. But those of you who know me, know that I take a challenge very seriously and I DO NOT like to not do well. On the left, meringues. Not macarons. Definitely undermixed.On the right, cracked meringues. Definitely not macarons. Nibs not ground fine enough and undermixed batter. On the left, same scenario as above. Nibs not ground fine enough, batter undermixed. On the right, nibs not ground fine enough PLUS egg whites over beaten, making the insides cakey rather than macaron-y. When the egg whites are over beaten and the nibs are not ground fine enough, it’s really tough to get the batter the right consistency – lava-like. Sadly surrounded (on the right) by their inconsistent brothers and sisters. INFURIATING! This is a tray that’s been turned halfway through the baking time to avoid cracking from hot spots. Or not. I know, I know, they have crackly little feet but they kind of sort of work, no? Stella told me to say “they’re not classic French macarons but they taste delicious and they are tree-nut free.” She’s right and nibs will never behave like almonds so these might just be as good as they get… Not too shabby, right? Despite their non-conventional appearance, these rank amongst the tastiest macarons I have made in a while. The cocoa nibs give a fabulous fudgey flavour and I filled them with a peanut-butter chip ganache (basically peanut butter chips and cream – how can you go wrong?). I put them in the fridge (it’s kind of warm and humid here) and they are wonderful brought to room temperature – fudgey and rich. Optional: Red food colouring (natural by preference, artificial if you can’t find natural colours and are not allergic – Shulie’s blog is artificial colour free so I want to respect that). You can also bake them with no colouring but be warned that cocoa bakes grey so the colour ensures the macarons remain a nice chocolately brown. You'll need about 15 drops of liquid or 1/2 teaspoon of powder. Preheat the oven to 320°F. Place a large (14") pastry bag fitted with a plain tip upside down in a glass so that you can easily pour the batter in when it's ready to pipe. Line 2 baking trays with parchment paper and place each tray on top of another tray. I find the double trays help prevent the macarons from cooking too fast on the bottom. Grind the cocoa nibs in a spice/ coffee grinder. You will need more than 29g because you want 29g of POWDER. 29g of nibs will not produce 29g of powder that is fine enough to use. Grind about 30g at a time and sift into a bowl on a scale to make sure you are using 29g of powder. Even in a spice grinder all the nibs won't grind up fine enough to use. Set the leftovers aside for use in baking. Place the nib powder, cocoa and powdered sugar in a food processor and grind until well combined. Sift this mixture twice over a large bowl and set aside. In the bowl of a stand mixer, combine the egg whites and caster sugar and beat at a low speed (Kitchen Aid speed 4) for 2 minutes. Increase the speed to 6 and beat for another 2 minutes. Increase the speed again to 8 and beat for another 1 minute. The egg whites should be fairly stiff at this point. Add the dry ingredients to the meringue, all at once and fold them in. To successfully incorporate the dry ingredients in the meringue, you need to use both a folding motion and a pressing motion. You are aiming to deflate the meringue against the side of the bowl. The macaron batter with cocoa nibs will be fairly thick. I beat away at it for about 100 strokes in the batches that worked and had feet. I even considered using the paddle attachment of the Kitchen Aid. Basically, the macaron batter needs to be thick enough that it will mound up on itself, but fluid enough that after about 20 seconds, it will melt back down.Think lava. Pour about half the batter to a piping bag and pipe the batter in small circles on the tray. When I pipe macarons, I hold the bag at an angle, with the tip always touching the tray. When I have piped enough for one macaron, I make a comma-like movement to remove the tip from the tray. That little comma-shaped bit of batter will settle down when when you rap the trays 4-6 times on a hard surface to remove any air bubbles that might remain. Bake for 6 minutes, one tray at a time, then turn the tray from front to back for another 6 minutes. You'll be able to tell at the 6 minute mark if your macs will succeed - the feet will have formed by then. Remove tray from oven and remove the macarons on the parchment paper from the tray. Place on a cool surface and cool thoroughly, then remove the cooled macarons from the parchment paper. Fill a pastry bag fitted with the filling of your choice and pipe a quarter sized mound of ganache (or whatever) into half of the shells, then sandwich them with the other half. 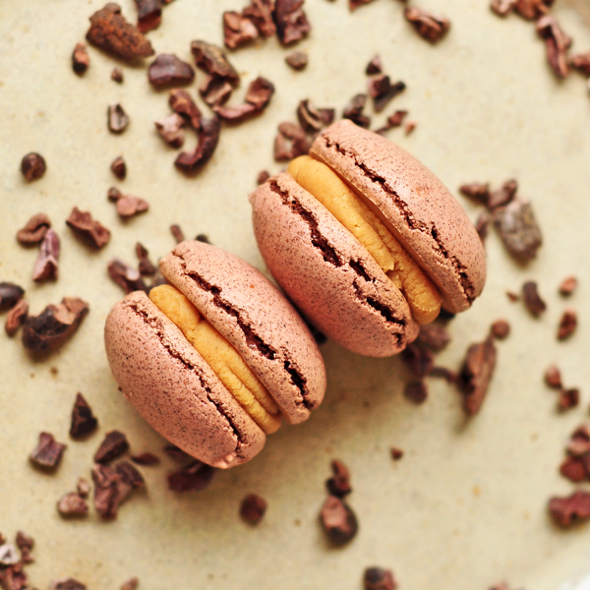 Even though you will want to taste them right away, macarons actually get better with age. The shells soften and become more chewy, mingling with the flavor of the filling too. You can store them in cool place for up to a week. If you store them in the fridge, bring them to room temperature before you eat them. Thanks so much Shulie for having me and my experimental macarons here today. 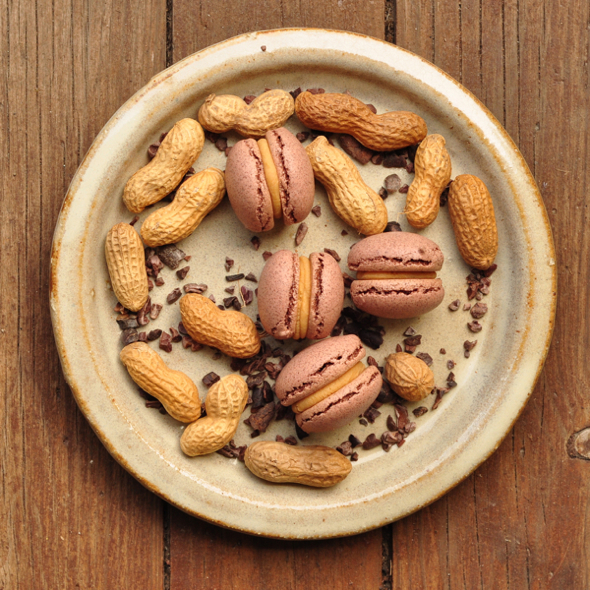 I hope this will inspire people to have a go and experiment with macarons sans almonds. If nothing else, it’s a delicious experiment! 1. 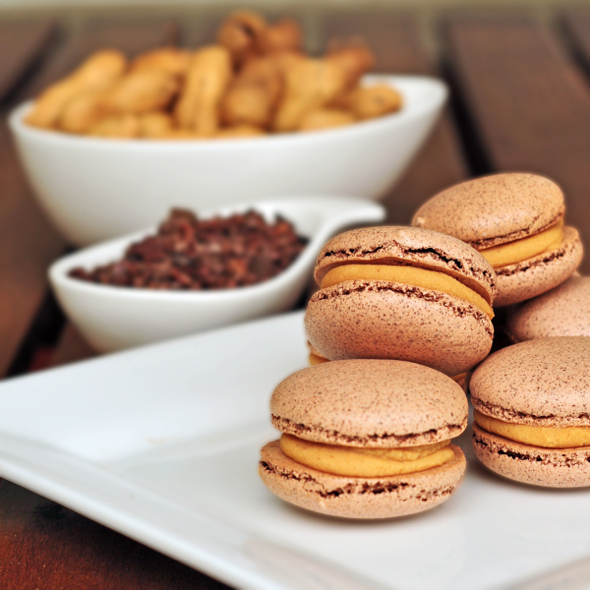 Mocharons, Chocolate-Coffee Macarons with White Chocolate Ganache by The Daily Palette. 2. Pumpkin Seed and Matcha Macarons with Coconut, Dark Chocolate Ganache by Brave Tart. 3. 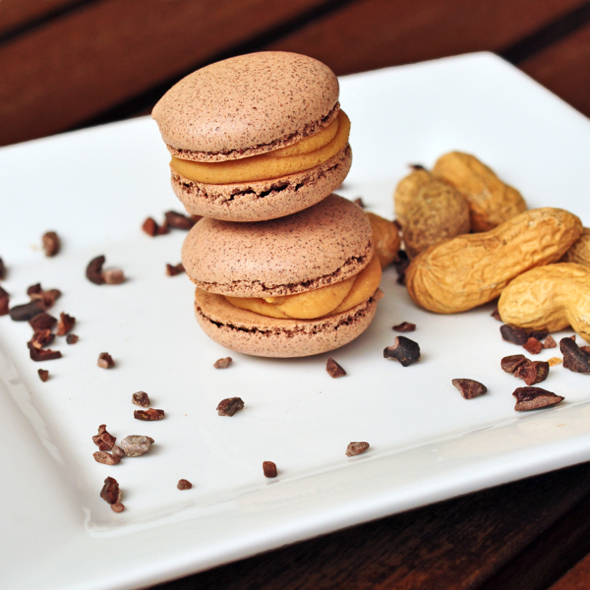 Cocoa nib Macarons with peanut butter ganache by eat.live.travel.write. Go to visit these three ladies' sites and show them some Macaron love! Excellent series and lovely lovely post. I truly enjoyed all 3 of them. @Mardi: Thank you for sharing your experience. These macs look gorgeous!! Wow Mardi! You certainly don't back down from a challenge (but we all knew that about you) and your efforts paid off wonderfully. Great post! Enjoy your summer in France! Mardi, your tenacity is amazing. I think you did a brilliant job with these. They are beautiful! I think you pulled this off beautifully! I have never tried macarons and am quite intimidated! But the flavors are to die for! Seriously, I bow down to Mardi, Stella and Annapet! You guys are just awesome MacDivas! Love these, I seriously need to commit to making macs sometime SOON! Mardi, they're fabulous!! I can definitely speak from experience that cocoa nib macarons are definitely "advanced level" macarons (as if they needed to be any trickier). But the thing I think is important about cocoa nib macs is that they are freaking delicious. If you have a nut allergy, please, please, please don't be intimidated to make these. They'll probably crack. You can console yourself all night as you keep sneaking back to the kitchen for "one more" before bed. They're unfathomably delicious no matter how they turn out. Mardi, yours are gorgeous. The photography also amazing, those peanuts really POP. And thanks to Shulie for inspiring this series, which has been so much fun! wow, these look like little "nutter butter" cookies! great flavors and they are absolutely adorable!!! great guest post! Hats off to your patience, Mardi! I tried once and got half footed Macs and that was the last I had a date with them :) Love these tiny baked goodies, and kudos to your efforts. Having never made a single macaron in my life, I am seriously impressed! I have some cocoa nibs in the pantry, but probably not enough...The PB chip ganache sounds fabulous too! Mardi, those macs look terrific!! And the flavors are yummy-good! Lovely idea and beautiful macs! Only you have such patience to continue with trays and trays until you've (sorta) figured them out. As someone who did try them, they are indeed tasty, fudgey and rich! Mardi, you never fail to impress me with your search for the perfect macarons... and these, even the not-so-perfect ones, look absolutely fabulous (and I can just imagine how amazing they'll be folded into Eton Mess... swoon). Mardi, your tenacity is admirable! These may not be traditional macarons, but they look near-perfect and if they taste like fudge brownies, then they're fab to me. Thanks also for showing us your near-misses with cocoa nibs, it gives me a bit of hope with my my own quest to achieve perfect (regular) macarons. Great series of posts, Shulie. So enjoyable, thanks! I am so late getting here! Mardi thank you for this post! I cannot wait to bake with cacao nibs. I have some just sitting in the pantry not sure what to do with them until your post came along. I think they are lovely, Mardi!